Successfully Added Xiaomi Mi Mix 2 Android Smartphone - 5.99-Inch Bezel Less, Bluetooth 5.0, Android 7.0, Snapdragon 835 CPU, 6GB RAM to your Shopping Cart. With the Xiaomi Mi Mix 2 Android phone, Xiaomi has once again managed to impress the entire smartphone industry. Its stunning 5.99-Inch bezel less display features an approximate 93% screen to body ratio. Thanks to this, you’ll be treated to truly unlimited visuals while enjoying your favorite media on this breathtaking Android phone. But this is not all, besides being exceptionally large, the display also features an Ultra-HD 2K resolution. This further increases your media experience while playing games, watching films, and using Apps. Besides treating you to stunning visuals, the display itself simply looks amazing. With its sleek and modern design, this Android phone certainly is a feast for the eye. Underneath its revolutionary screen, the Xiaomi Mi Mix 2 Android phone packs the latest hardware. With the Octa-Core Qualcomm Snapdragon 835 CPU in place, you’ll be treated to clock speeds up to 2.45GHz. Along with this powerful processor comes 6GB of RAM. Together, this hardware allows you to tackle the latest games, movies, and Apps without needing to worry about slowing down your device. No matter what you throw at this latest Android phone, there is nothing that will bring it down. To make sure that you have enough space to keep all your files and media, it treats you to a whopping 256GB internal storage. 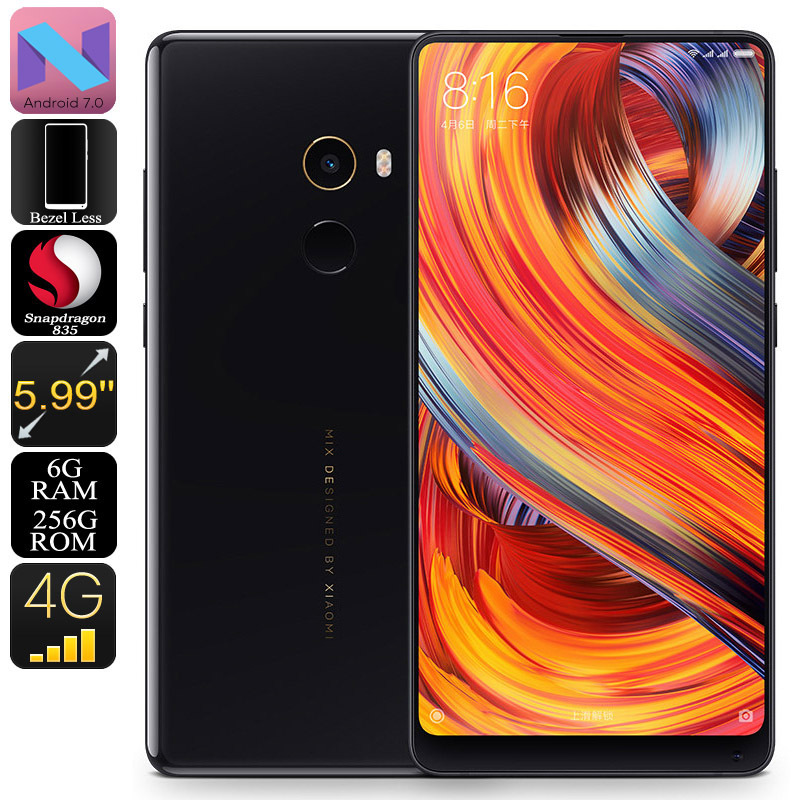 In order to keep its powerful hardware and stunning display running throughout the day, the Xiaomi Mi Mix 2 Android smartphone packs a 3400mAh battery. This cell provides you with enough juice to use your phone for up to 8 hours continuously. Therefore, you’ll never have to worry about running out of juice. Whenever battery life is running low, you’ll be able to recharge your device in the blink of an eye thanks to Quick-Charge support. For ultimate connectivity, the Xiaomi Mi Mix 2 Android phone comes with Dual-IMEI numbers, 4G, and Dual-Band WiFi support. This means that you can always be reached on two different phone numbers while using merely one device. Additionally, your Android smartphone also supports Bluetooth 5.0 for ultra-fast data and file sharing. It furthermore comes with a stunning 12MP rear camera that shoots mesmerizing images and stunning 4K video. This piece of hardware is sure to meet all your mobile photography demands. If you’re looking for an Android phone that has it all, the Xiaomi Mi Mix 2 certainly is the way to go. The good point is storage and memory ram.